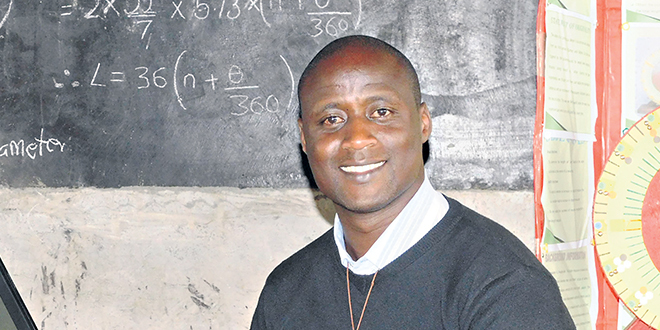 Teaching habits: Franciscan Brother Peter Tabichi won the Global Teacher Prize. ONE million dollars is a lot of money. You could pay off your mortgage, or you could go on a worldwide holiday, or you could retire early. But for Franciscan Brother Peter Tabichi, $1 million in winnings was $1 million to be given away. Br Tabichi won the million-dollar 2019 Global Teacher Prize at a conference in Dubai on March 23. He beat out 10,000 other teachers from 179 countries, and did it all wearing his simple brown habit. “This prize does not recognise me, but recognises this great continent’s young people,” Br Tabichi said. His modesty understated his influence. Br Tabichi teaches science at Keriko Mixed Day Secondary School in Pwani Village, situated in a remote, semi-arid part of Kenya’s Rift Valley. His school is like many in Kenya, underfunded and overcrowded. The classes, typically meant for 35 students, sometimes border on 80. Many of the students walk more than 6km on rough roads each day to school, which become impassable during the wet season. Br Tabichi himself often walks a similar distance to an internet café to download teaching resources. “The school is in a very remote area,” Br Tabichi said. “Most of the students come from very poor families. “Even affording breakfast is hard. But, even with the setbacks, his students have had national and international science competitions. His students won an award from the UK Royal Society of Chemistry for harnessing local plant life to generate electricity. His pupils also placed first in the public school category at the Kenya Science and Engineering Fair 2018. They submitted a device allowing blind and deaf people to measure objects. The mathematical science team also qualified for the INTEL Interantional Science and Engineering Fair 2019 in Arizona, USA. “I’m immensely proud of my students, we lack facilities that many schools take for granted, so as a teacher, I just want to have a positive impact not only on my country but on the whole of Africa,” Br Tabichi said. Beyond competitions, more students are heading to college under Br Tabichi’s tutelage and girls’ tests scores have seen a sizeable boost – leading boys in all four tests set last year. Br Tabichi said part of the challenge had been to persuade the local community to recognise the value of education. He visits families whose children are at risk of dropping out of school and gives one-to-one tuition outside of class and on weekends. Enrolment has doubled to 400 students over three years. He started a talent-nurturing club and expanded the school’s science club, helping pupils design projects of such quality that 60 per cent now qualify for national competitions. But his teaching wasn’t limited to his school. The area experiences famine every three to four years, so Br Tabichi has been teaching the locals how to grow famine-resistant crops. “Food insecurity is a major problem, so teaching new ways of farming is a matter of life and death,” Br Tabichi said. And he works against another horseman too – war. Tribal violence devastated the Rift Valley after the 2007 presidential election, killing many in the region. In the visage of his patron, Br Tabichi started a peace club to unite the seven different tribes represented at the school. He’s also introduced a common program for prayer and worship in assembly, led in turn by pupils from different religions. Over video link, Kenyan President Uhuru Kenyatta congratulated the Franciscan brother at the conference. “Peter – your story is the story of Africa, a young continent bursting with talent,” Mr Kenyatta said.